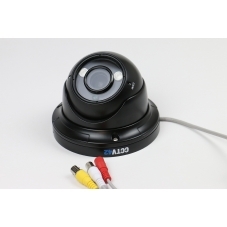 Buy good quality open face vandal dome CCTV cameras in either standard definition or HD 1080P. Built in IR makes these cameras suitable for day or night time use. Available in a number of lens options including wide angle or long range. We always recommend fitting varifocal cameras which can be adjusted during installation to balance area covered with detail captured. If you need help choosing which camera to buy we have a CCTV camera buying guide. Alternatively contact us by phone or via email. We are not just a website, we are a real company only too happy to advise on your specific project. 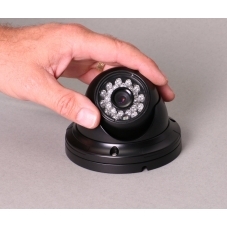 Our open face vandal dome cameras have some subtle features which ensure ease of installation. All the allen bolt fittings are front facing including the retaining ring lock screws. Fixing bolts are self retained to stop them falling on the ground during installation, a simple thing but much appreciated when you`ve been on your knees for 10 minutes looking for a tiny screw that`s fallen on the ground ! These cameras are IP rated for outdoor use but are equally at home when used inside. The small open dome cameras in particular fit unobtrusively into most environments. The large open dome cameras feature varifocal zoom lenses which can be set during installation to balance between area covered and detail captured. IR lighting automatically switches on as light conditions fall making these a true day or night camera. The split optical glass prevents internal reflection of IR light into the camera. As light levels fall the camera automatically switches from colour to black and white and the IR illuminates. Power and video connections are industry standard DC and BNC plugs making our cameras compatible with existing systems. Our new HD 1080P cameras feature an on screen display menu which allows you to fine tune the cameras performance. This can be accessed remotely using our HD 1080P DVR recorders.